Tendinopathies, Carpal Tunnel Syndrome, Myofascial Trigger Points, Lateral Epicondylitis (Tennis Elbow), Ligament Sprains, Muscle Strains, Repetitive Stress Injuries, Chondromalacia Patellae, Plantar Fasciitis, Rheumatoid Arthritis, Osteoarthritis, Shoulder, Back & Knee Pain, Herpes Zoster (Shingles), Post-Traumatic Injury, Trigeminal Neuralgia, Fibromyalgia Diabetic Neuropathy, Venous Ulcers, Diabetic Foot Ulcers, Burns, Deep Edema/Congestion, Sports Injuries, Auto & Work Related Injuries. Your K-Laser treatment must be delivered directly to your skin. Wear clothing that will allow access to the area. Shorts, sweat pants. 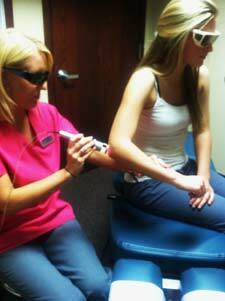 Patient receiving laser therapy on elbow. The number of K-Laser sessions you will need depends on the nature and duration of your condition, and other factors. Some acute conditions will respond in 6 or fewer sessions, whereas chronic conditions may take more treatments. Most patients describe it as a very soothing, warm sensation. Since the K-Laser is a high-powered therapy laser, your skin will get warm during the treatment. Many patients feel a significant reduction in pain on the first visit. Occasionally, patients will feel slightly more pain immediately after the treatment – and then feel much better the next day. You may feel pain relief after just the first treatment. For other patients, it takes a while longer. Most patients report feeling very relaxed, or even tired. If you feel a lot less pain, keep in mind that pain reduction is just one goal. The K-Laser is giving your body’s cells more energy so they repair and regenerate new tissues. The effect of K-Laser therapy treatments is cumulative. You will be getting more benefit with successive treatments. For the most part, no. Obviously you do not want to overexert and reinjure yourself. You may need to make changes in your work station. If you are planning to work out, you may want to reduce the intensity, or change the nature of your exercise. Discuss this with your doctor. One effect of the K-Laser treatment is vasodilation – which means your blood and lymphatic vessels have a larger diameter. This helps with inflammation reduction, but for some people the vasodilation can also make them sore. Use ice on the area, as directed by your doctor. You could use a pain relief gel. I feel a lot better – but I sill have sessions remaining in the K-Laser treatment package I bought. What should I do? Pain relief is just one goal in your care. K-Laser treatments help your body’s repair and regeneration processes. Completing your K-Laser session package will further assist the healing processes. We suggest that you use all the treatments in the package, to ensure the most effective care possible. Why do I have to wear safety glasses during my K-Laser treatment? 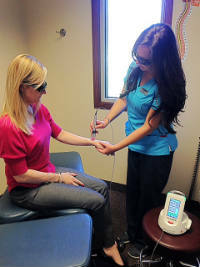 The K-Laser is a high-powered therapy laser. Laser light can be focused be the lens of your eye, and potentially cause damage to your retina. The safety glasses you wear specifically block out the wavelengths of light produced by the K-Laser. For even more information on the K-Laser, please click HERE. Or call Goss Chiropractic Clinics at (586) 264-2100.